External storage solutions provide an easy method to increase the capacity of media and data that may be used in a variety of use cases. Our look at the Mediasonic ProRAID HUR5-SU3 found it to be a very cost effective solution for repurposing spare hard drives or creating a new volume of bulk storage for computers. While there is certainly a market for what we’ll refer to as entry level external storage solutions, creative professionals will require something considerably more robust to satisfy their needs for capacity and performance. The dip-switch based configuration model of the ProRAID, when combined with the limitations of a maximum of two drives, will not fulfill workflows that support high resolution video or other I/O intensive operations. At the next tier of direct attached storage solutions, Drobo is a name that has historically provided unique tangibles that are unmatched by competitors within a given price bracket. Does the Drobo 5C have what it takes to support professionals and prosumers alike? The Drobo 5C serves as the lowest cost entry point into the product stack. This compact box provides a very simple way to take a pool of five individual disks and create a larger volume that is recognized by the operating system of choice. All units within the product line offer tool-less drive installation into all available 3.5″ slots as well as supporting dissimilar drive capacities. The secret sauce on the backend of the Drobo solution performs the necessary calculations and configuration settings applied from the Drobo Dashboard to present a singular 64TB (Drobo 5C, 5D-series, and 5N-series) or 128TB drive (Drobo 8D) using disks that are installed in the available drive bays. One of the beneficial features that Drobo shares in common with competing NAS solutions involves the simplicity of migration. Upgrading from a 5C to a 5D3 involves moving the drives from the 5C to the 5D3 while both units are powered off in order to mitigate the risk for potential data loss. While these units are capable of handling online drive replacements to increase capacity, taking a multi-terabyte storage pool down to an available capacity that is smaller than the total quantity of data being stored will present the risk for data loss in the majority of available solutions. Moving up the product stack provides more capable processors within the succeeding units in addition to either Thunderbolt or dedicated network interfaces. Improvements over the past few years have resulted in a number of applications for media serving and disaster recovery being available for the 5N series. All units excluding the 5C also contain provisions to add an SSD as a cache to further accelerate performance. The 5C is a very mature product at this time. BeyondRAID, which is Drobo’s proprietary technology for the pooling and redundancy capabilities in this product, is incredible efficient and transparent. The primary configuration option, which we’ll delve into during the overview of the Drobo Dashboard product, pertains to fault tolerance settings for installed disks. An additional feature available for macOS involves provisioning a dedicated volume for Time Machine backups. 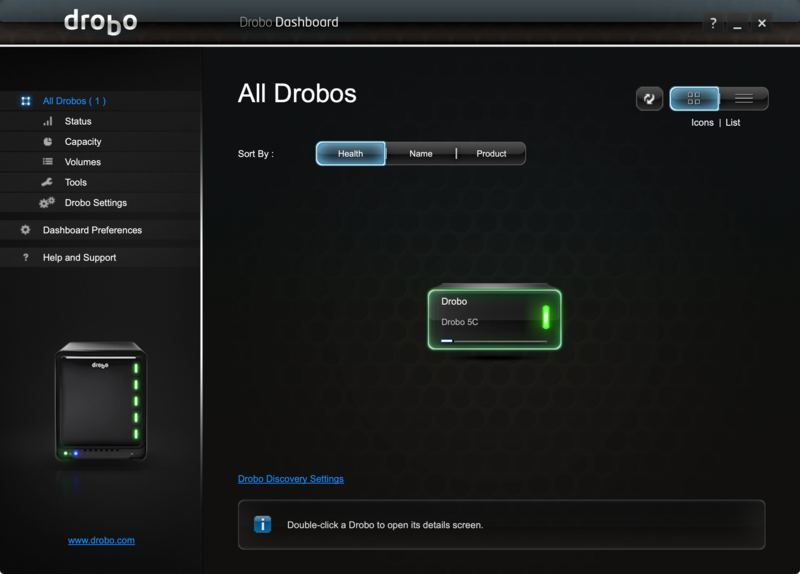 Installation of the appropriate version of the Drobo Dashboard (based on operating system) was uneventful. Upon completion of the install and providing the necessary information to either bind the device to an established user account or successfully creating a new account, the software detects the units that are connected via available methods. Double-clicking the pictured unit brings up the status page which provides the unit’s name (which can be customized), the Serial Number, Health Status, Firmware Version, and the interface which is being used. Our unit is outfitted with (5) 5TB drives: (4) HGST Deskstar NAS drives and (1) Toshiba X300 Desktop drive. 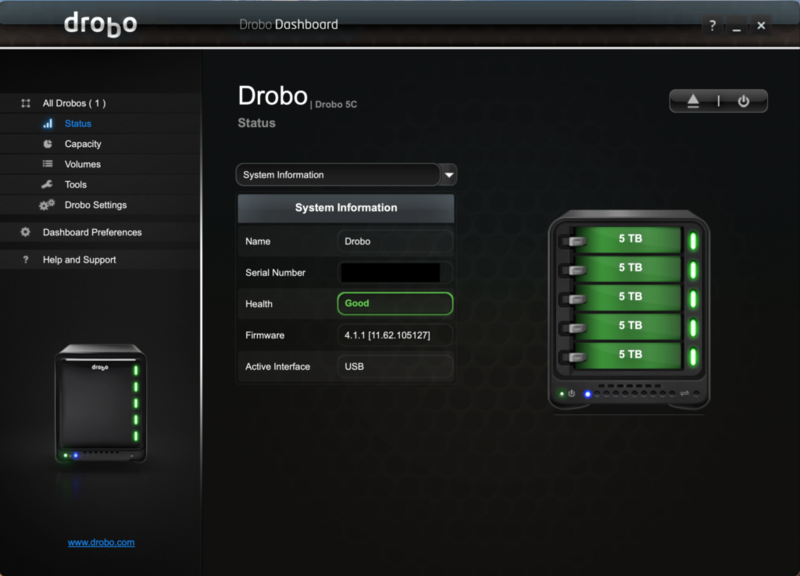 Firmware 4.1.1 is the most recent version offered for the Drobo 5C. The forward-thinking nature of the Drobo 5C’s USB connectivity ensures usability and compatibility with future systems. The transition to USB-C has been slower than expected in the PC space yet is predominant for modern Macs thanks to the adoption of Thunderbolt. While Drobo includes a USB-C to USB-A cable in the box, this cable can be replaced with a USB-C to USB-C cable in the future. The Volumes menu item simply presents the actual capacity available from the pool of disks as well as how much of it is being used. The Tools menu item enables graceful shutdown of the Drobo, power resets, and formatting when required. In addition, future updates to the dashboard may be obtained using this menu. 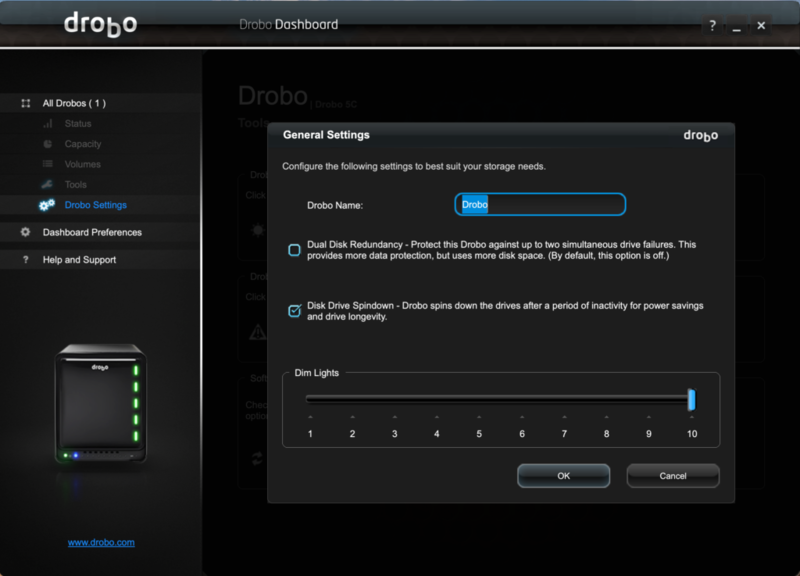 The final menu item, which is Drobo Settings, is where the bulk of end user customization occurs. As you can see in the screenshot above, this is where the device can be renamed. This is exceptionally useful if and when multiple Drobos are deployed within a given environment. The checkbox for Dual Disk Redundancy sets the unit up to be able to sustain a failure of up to two disks. Those who religiously follow BackBlaze’s Drive Reliability Reports know that failure rates vary by manufacturer. If you’re using high capacity drives (8TB or larger), we would encourage taking the capacity hit and enabling dual disk redundancy. The last thing anyone wants is data that cannot be recovered. The Disk Drive Spindown option is somewhat of a mixed bag. In practice and application, this setting aids in reducing wear on the installed drives as well as providing a small savings on electricity. Earlier versions of the firmware incurred a bit of a noticeable pause within Windows as the drives were being spun back up. While we did not notice this behavior again on either platform with the latest firmware, the fact that there was a noticeable impact to general system performance during the spin-up process ultimately leaves the decision for enabling or disabling the feature up to you. Blackmagic Disk Speed Test version 3.2 was used to determine the performance of the Drobo 5C. Our methodology involved executing 12 passes using the 5GB Stress Test File setting and taking the average of these values. Each pass was also analyzed to identify the burst performance numbers for read and write operations along with the lowest sustained values for throughput. The average of twelve passes are provided in the table below along with the highest and lowest values. The Drobo 5C performs exceptionally well for bulk storage use cases along with light prosumer media handling. Complex file formats that are IO dependent will not be a good fit due to the limitations of this unit. Editing 2160p video formats at high frame rates or manipulating complex files will require stepping up to a more performant unit in the Drobo family. While the setup and basic use of the Drobo 5C makes it as easy as possible, there are some construction and support deficiencies that must be noted. Prior to our ownership and testing of the Drobo 5C, we also had previously utilized a Drobo 5D. The latter model was one of the first Thunderbolt-enabled, direct-attach storage solutions. After approximately one year of use, the Drobo 5D developed this incessant buzzing in the chassis that required putting a heavily weighted object on top of it to suppress the annoying sound. After the same period of use, our Drobo 5C is also exhibiting this same behavior. From a background noise perspective in an office setting, the buzz of the 5C is the loudest item in the room. Louder than a QNAP TS-1277 NAS with 6 hard drives and louder than a Threadripper-based system which uses air cooling. Shortly after our benchmark run and testing, the Drobo 5C started experiencing random “disk not ejected properly” events on our 2018 Mac mini. A ticket opened with Drobo support received a response in a timely manner. The technician was courteous but didn’t offer much assistance. The provided suggestions of “use a different USB port” and “uninstall the software” (with no mention of re-installation to monitor/manage health) didn’t add any value in resolving the issue. If your environment is noise-sensitive (i.e. podcasting, recording) or you’re using a Mac, the Drobo may not be a viable long-term option. From a setup perspective, Drobo did a fantastic job with the 5C. This is a solution that works incredibly well initially for general purpose bulk storage. For approximately $350 USD, you get a compact unit with 5 hot swap bays and simplified administration. While the tested performance doesn’t make the Drobo 5C ideal for intense, professional workloads, it serves its purpose well for general purpose storage. The integrated battery that protects data in the local cache during a power loss event is uncommon at this price point. The annoying and variable vibration that seems to be commonplace after year one, when combined with a lack of equivalent trouble-free operation outside of the Windows platform, must carefully be considered before purchase. The release notes pertaining to the Drobo firmware identify repeated instances where a fix was required to prevent connectivity issues on a Mac. The Mac side of the equation also requires a to-be-developed Dashboard update to eliminate the messages that will appear in the console due to use of deprecated libraries. When the Drobo 5C performs quietly and reliably, it represents a fairly decent value for its cost. The lack of long-term quiet operation and cross-platform compatibility issues will ultimately require more work from Storcentric to produce a product that stands the test of time. Within this price bracket (or less), most competing solutions will only consist of four-bay units. Mediasonic, Highpoint, QNAP, and a number of smaller niche players exist in this space. Seeing that the QNAP TR-004 ($199) and the Highpoint Rocketstor 6114V ($199 on Newegg at the time of this writing) can be had at a lower price and will not suffer from the issues we encountered with the Drobo 5C, we would conditionally recommend the Drobo for use cases where Windows is used and adding internal storage for a given system is not possible. Be sure to consider the vibration sounds that will most likely occur after the first year of use.